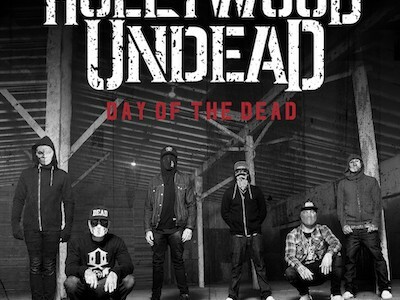 After carving their way through the world of rap rock with their previous three albums, Los Angeles band Hollywood Undead present their latest offering, ‘Day Of The Dead’, set for release on March 31. Hollywood Undead consistently produces cut-throat, emotive tracks that hit you straight in the face and this album is no exception. 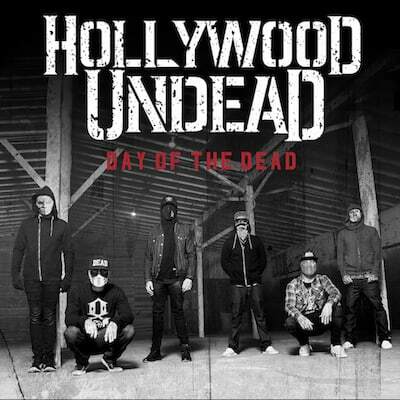 ‘Day Of The Dead’ combines all of HU’s notable characteristics from alternating vocals to artfully crafted combinations of rap and metal. However, unlike 2013’s ‘Notes From The Underground’, which pushed the band’s boundaries, this album relies on the reputation of its predecessors and sticks to the mould. Right from the start we’re hit with ‘Usual Suspects’, starting with a techno heavy intro layered with metal guitars and the contentious opening line “Woke up one morning on the Sunset Strip with a half smoked blunt and some blood on my lip”, to bring a true Hollywood Undead opening to the album. Right away we notice the undeniably clear production, working well with the clean/unclean vocal pairing to provide a balance throughout the album. ‘How We Roll’ brings in a slower sound early on in the album that builds into a post-apocalyptic setting with repetitive, steady drums, introducing the possibility of a dynamic build-up, but never delivers. The aptly titled ‘Dark Places’ has an unsettling intro like a dark, twisted circus theme. The alternating vocals spit out introspective lyrics; ‘I’ve gone way too far for this. I’ve put in too much work I’ve dealt with too much hurt’. Tracks like ‘Gravity’ and ‘Disease’ utilise a more reflective message in this way, backed by heavy, sometimes playful, electronic sounds, thrashing guitars and throbbing bass and drums. As the album progresses, it begins to sound like an internal struggle of “party” songs against inner-directed tracks, working against each other instead of side by side to create a balanced album. Songs such as ‘War Child’, ‘Party By Myself’ and ‘Guzzle Guzzle’ are solid dance tracks that could easily be heard in a club, but don’t necessarily fit in with the other tracks on the album. With a range of sounds and lyrical content, ‘Day Of The Dead’ is an amalgamation of divergent tracks that lacks the cohesion of Hollywood Undead’s previous albums.